Today, I have a really great product from iFabbo and MONAT. This is one of those products that truly is an all-in-one. 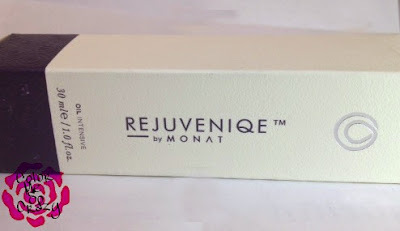 Rejuveniqe is an oil that you can use for many different parts of your body either to maintain a certain look or quality or to improve something that maybe lacking. Some of the great benefits include "an invigorating blend of 11+ unique molecular ingredients –including vitamins, minerals, antioxidants, beta-carotene and omega-3 fatty acids – that mimic the body’s natural oils". This blend helps reduce broken hair, reduce thinning hair, improve volume and improve shine. So, when you purchase this it comes with a neat little booklet that tells you the many ways this can be used. I was super shocked that not only could this be used on my hair, but it could be used on my skin, my nails, my elbows, my scalp, my face and just about every part of my body and it comes with with booklet that tells me how to use it. Hydrating treatment: Apply a generous amount to damp hair and scalp. Place a warm moist towel around the head and leave on for 30 minutes. Rinse thoroughly; shampoo and condition (optional). Some ingredients include: "Limnanthes Alba (Meadowfoam) Seed Oil, Crambe Abyssinica Seed Oil, Camellia Oleifera Seed Oil, Solanum Lycopersicum (Tomato) Seed Oil, Daucus Carota Sativa (Carrot) Seed Oil, Citrus Limon (Lemon) Peel Oil, Citrus Aurantifolia (Lime) Oil, Citrus Aurantium Bergamia (Bergamot) Fruit Oil, Adansonia Digitata Oil, Mauritia Flexuosa Fruit Oil, Cocos Nucifera (Coconut) Oil, Gardenia Tahitensis Flower Extract, Moringa Oleifera Seed Oil, Caryocar Brasiliense Fruit Oil, Helianthus Annuus (Sunflower) Seed Oil." There are so many organic healthy ingredients in this bottle that promote healthy cell growth and reproduction of body cells. I have been using this on my elbows, cuticles, hair and ankles since I got this product. 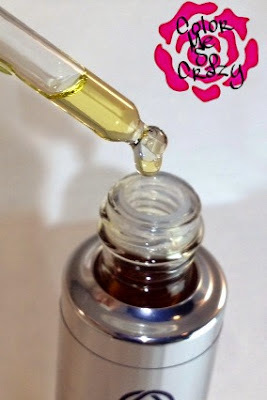 I was extremely nervous when I first started using it because it is an oil. I was so afraid I was going to break out because my skin is sooo sensitive and hates any kind of oil. I still have the skin of a 15 year old, so it's oily to begin with. I thought adding more oil to my hair let alone my face was just crazy. I am happy to report that I didn't have any issues with breakouts. The smell! It smells so fresh. I always talk about the smell of my products and I think it is so important. This one smells so natural and fresh. Kind of lemony. Overall this product was awesome. I felt so luxurious when I used it as an intensive hydrating treatment. The warm towel wrapped with the oil and the smell is just awesome and relaxing. The price is a little high, but I think it is well worth it since there are so many things you can do with this product. I have never met a product that I can use on my hair dry or wet and at the same time on my body dry or wet. I love it and really recommend it. You can purchase a 1oz bottle for $99.